Tosca Olinsky was born on March 11, 1909, in Florence, Italy. 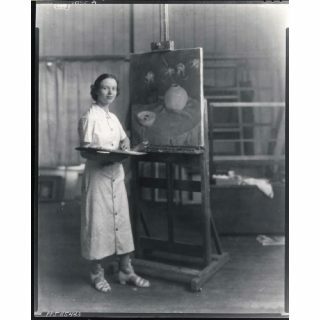 The daughter of Ivan Olinsky, (1878-1962), she worked primarily in New York City and Old Lyme, Connecticut where she joined her famous father, who was long associated with the Old Lyme Artists Colony. There she was both an active painter and teacher at the school. 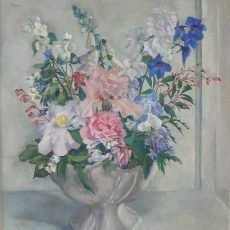 She was a member of the National Academy of Design, American Water Color Society, the National Arts Club and the Lyme Art Association. She exhibited in sixteen annual exhibitions of the National Academy of Design, won the Gloria Layton Prize in 1960 at the Allied Artists of America exhibition, and displayed works at the National Arts Club in New York, in 1934, 1935 and 1937. In 1957, she won the Jane Peterson Prize and 1957 the Lamont Prize at the Audubon Artists Exhibition. Other exhibition venues included the National Association of Women Artists and the Pennsylvania Academy. A one-person show was held in 1958 at the Lyman Allyn Museum in New London, Connecticut. Tosca Olinsky painted in a somewhat decorative manner, employing both principals of Modern Art such as French Cubism and American Precisionism, with restrained subject matter, often still lifes. Little is known about the last 20 years of her life except that in 1982, the year before she died, she was living in Old Lyme on Beckwith Lane.